In honor of National Sauce Month, we present: harissa verde. 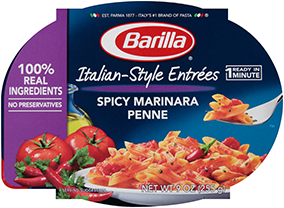 This spicy concoction pairs perfectly with vegetables, while Barilla® Collezione orecchiette pasta serves as the perfect vehicle for all that flavor. 1. In food processor place shallots, garlic, jalapenos, olive oil, Poblano pepper, cilantro and cumin seeds. Pulse until thoroughly combined but still slightly chunky. Season with salt and pepper to taste. 2. Cook pasta according to package directions; drain, reserving ½ cup pasta water. 3. Place pasta back in cooking pan and add reserved pasta water, Harissa Verde and tomatoes.